How Tennis Strings Go "Dead" — Part 1. What do players mean when they say strings "go dead"? What does science say happens to strings over time and play? How Tennis Strings Go "Dead" — Part 2. Do strings lose their elasticity, resilience, and energy return over time? The answer might surprise you! Why is string stiffness so important? It is because the stiffness of the strings relative to the ball has a great deal to do with how much energy is lost when the ball and racquet collide. Stiffness is resistance to deformation. In tennis we talk about ball compression, string elongation, string plane deflection, racquet bending, and racquet torsional twisting. These are all forms of deformation. Energy, like water and humans, follows the path of least resistance — in other words, it flows toward softer, less stiff pathways. Depending on the properties of a particular path, that energy will be more or less recoverable for powering the ball. The ball-strings pathway is one crucial place where a player can influence the direction and consequences of the flow of energy. Obviously, that jointly experienced force will deform the softer of the two objects more (and it will also change the motion of the lighter object more). One definition of energy is that energy equals the force on an object times the distance the object moves or is deformed (compressed or elongated) due to that force. So more energy will go into the softer object because it is deformed a greater distance by the same force. 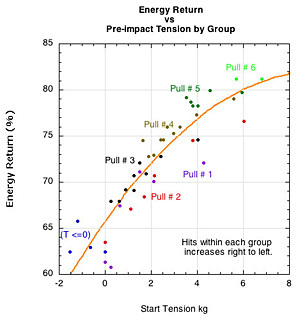 The same applies to the relationship between a ball and a racquet stringbed when they collide. To demonstrate this, imagine a racquet with its head clamped (for example, secured as if in a stringing machine). Clamping prevents the racquet from bending, recoiling, and vibrating. In other words, we have road-blocked some of the possible energy pathways. We have redirected traffic, so to speak. Consequently, if we drop a tennis ball onto the stringbed, all the ball's energy of motion (which we know exactly just by knowing the height from which the ball is dropped) will be channeled into stretching the strings and compressing the ball, and none of it will go into these other motions. Now we have all the energy isolated so we can determine how, without interference of any other factors, the bounce of the ball changes when we change the stiffness of the stringbed. The higher the bounce, the more energy is returned. The important thing to realize is that tennis balls lose more energy than tennis strings. A ball is designed by the rules of tennis to lose 45-47% of the energy that goes into deforming it when it bounces (off the court or strings). The strings, on the other hand, are designed to return as much as possible of the energy that goes into stretching them during impact. Most strings only lose about 5% of that energy*. If the ball loses 45% of its share of energy and the strings only 5%, obviously to get more power we want to channel energy of impact into the strings and away from the ball. We want the strings to get a bigger share of the energy. How do we do this? 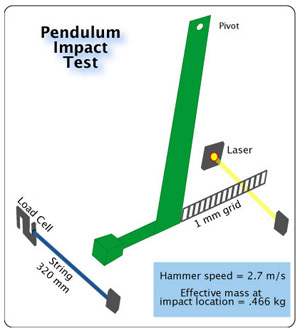 Consider the case of the stringbed and the ball being of equal stiffness. Then each will get 50% of the energy available to them (remember energy is going elsewhere too — into racquet deformation, heat, sound, and continuing the racquet's forward journey) . The ball will lose 45% of its 50%, returning a total of 27.5% of the energy. The strings will lose 5% of its 50%, returning 47.5% of total energy. In this case the total combined energy return is 75%. On the other hand, if the string stiffness is one half that of the ball, then 66.6% of the energy will go into the strings. The strings will return 95% of that, or 63.3%. The ball will get 33.3% and return 55% of that for 18.3%. The total returned energy is 81.6%. That's an increase in 6.6% compared to the first example. To some, that may sound like a nifty increase. To others it may seem minuscule, especially since a whopping 50% reduction in string stiffness was needed to get the energy increase. We look at that debate elsewhere — i.e., how many miles per hour difference do you get by changing stringbed stiffness? But for our purposes here, the principle is simple: Whenever you lessen the stiffness of the strings by reducing tension or by using softer strings, you will direct more energy into the strings and less into the ball, and you will thereby lose less energy and get more power. You don't have to know what the stiffness of the stringbed or the ball actually is. You just have to know that every time you reduce the stiffness of elements that make up stringbed stiffness — like string material, tension, pattern, headsize, or gauge — you will increase the percentage of energy return. In other words, you will get more power! **Note: A semantic clarification is needed here. All strings are about equally powerful and resilient. They all return about 95% of the energy that goes into them, no matter the material, tension, or gauge, or whether they are old or new. If you dropped a steel ball on the clamped racquet above, all the energy would go into the strings because the ball would not deform. And no matter which string you use, the ball would bounce to the same height returning about 95% of the energy. All strings, for all practical purposes, are equally efficient energy storage and return facilities. To say that a string is less powerful is correct if by saying it you mean that it TAKES IN less energy than a softer string when colliding with a tennis ball. This is a relationship problem, not an innate character flaw.